"Thin layered blini with melted butter.. a true Royal Russian breakfast! Best eaten with sour cream, jams and honey." 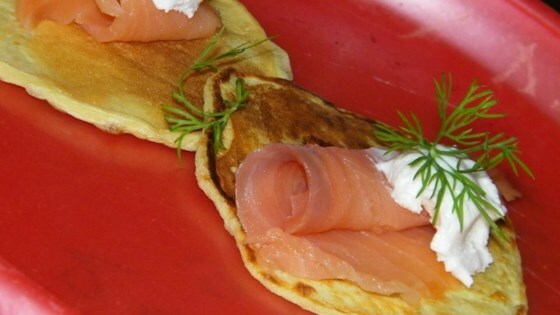 Remove blini to a plate. Put a little butter on top, and continue to stack the blini on top of each other. To serve, spread with desired filling, then fold in half, and in half again to form a triangle. Mmm Mmm! Good recipe. Topped with sour cream and caviar. The mix of ingredients does not work. Do not try this one!